It´s an exercise to practise the quantifiers: much, many, a lot (of), so much, so many, too much, too many. 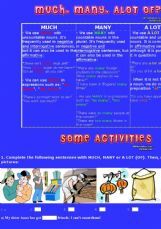 There´s a short grammar explanation and some activities to complete. I hope you like it!